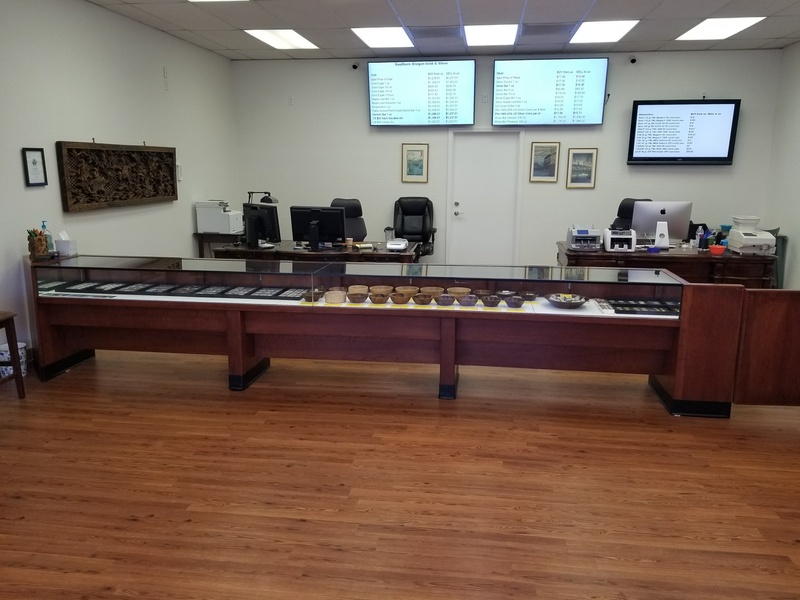 Southern Oregon Gold and Silver in Medford is a precious metal and US numismatic coin dealer. We are a local resource that buys and sells gold, silver, platinum and palladium bars, rounds and coins. We serve Medford, Ashland, Jacksonville, Central Point, White City, Shady Cove, Eagle Point, Talent, Phoenix, Rogue River, Grants Pass, Klamath Falls, Cave Junction, Coos Bay, Bend, Northern California and more! We're nationally competitive buyers of gold and silver bullion, US numismatic coins, scrap gold, placer gold, rolex watches and diamonds. SPECIALS: We are selling Monster boxes of Silver Eagles @ spot + $2.50 per coin! We have a large selection of US graded $20 gold Liberty and Saint Gaudens coins in stock at very competative prices. We are selling 1 Kilo silver bars @ spot + 70 cents per ounce when you buy 5 or more! We make your transactions with us simple, clear and easy to understand. To that end, we display a current price list of our products on a screen in the store and we give you the spot price of the metal you’re trading in before you buy or sell. The shop is located in The Biddle Center at 1550 Biddle Road, Suite B, Medford, Oregon 97504. Our cross streets are Biddle Road and Progress Drive. We are open Monday through Friday 10:00 AM to 5:30 PM and Saturday 11:00 AM to 3:00 PM. For a list of the Gold and Silver bars, rounds and coins that we SELL click here. For a list of the Gold and Silver bars, rounds and coins that we BUY click here. For a list of Gold jewelry, placer gold, dental gold and other precious metal scrap that we buy click here.